I have been spending a lot of time on the coast of South Africa and so have managed to find two species of gull, six species of tern, and one species of jaeger in the past 6 weeks. It is sort of surprising to me how limited the number of gulls here is, but at least there has been a nice assortment of terns. The photo above was taken at the Dwesa Nature Reserve of a tern roost that was near our camp. I think it really captures the classic assortment of species here on the Wild Coast. There are Swift Terns, Sandwich Terns, a Kelp Gull, and three African Black Oystercatchers in the photo. For this post, I would like to share some photos I have taken of the more common gull and tern species as well a one jaeger species. 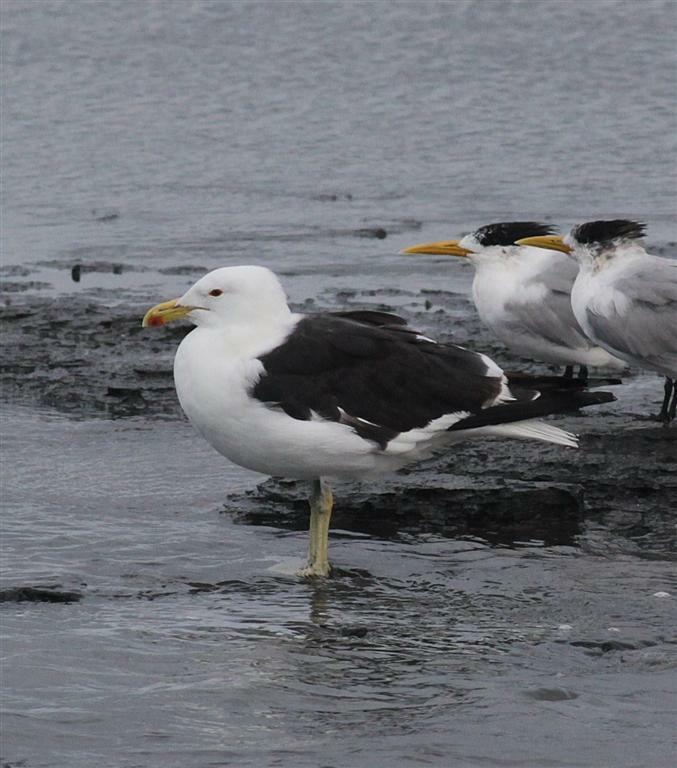 The gull above may look very similar to the Great Black-backed Gulls that we see in the United States, but it is actually a Kelp Gull. The Kelp Gull is an extremely common resident along almost the entire coast of Southern Africa. This beautiful gull is the Hartlaub’s Gull. This species is common and abundant, but only along South Africa’s west coast. It is an endemic species to South Africa. 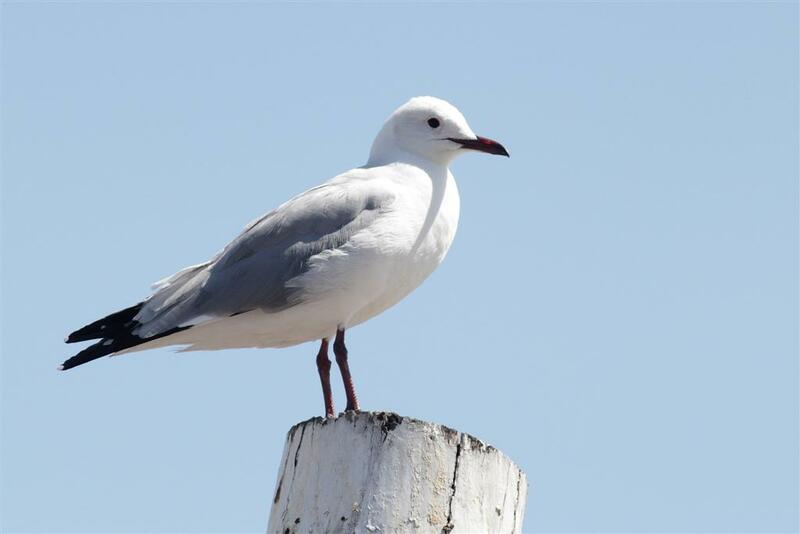 While we were in the Cape Town area we saw hundreds of these gulls. Their clean white coloration in combination with their deep red bill and legs make them one of the most attractive gulls I have ever seen. 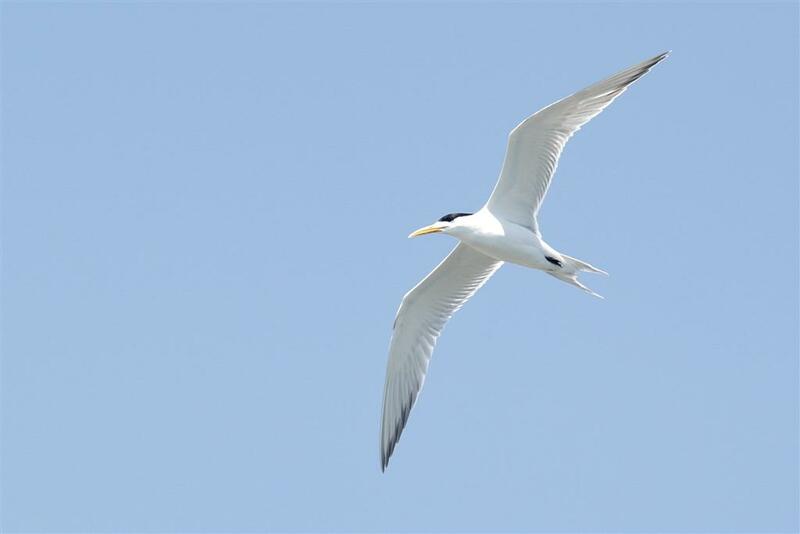 The most commonly encountered tern along any coastline in southern Africa is the Swift Tern; now known as the Greater Crested Tern on an international basis. This massive gull reminds me a lot of Royal Terns, except for this species’ stunningly yellow bill. Many places I have been along the coast have had impressive roosts of these big terns. 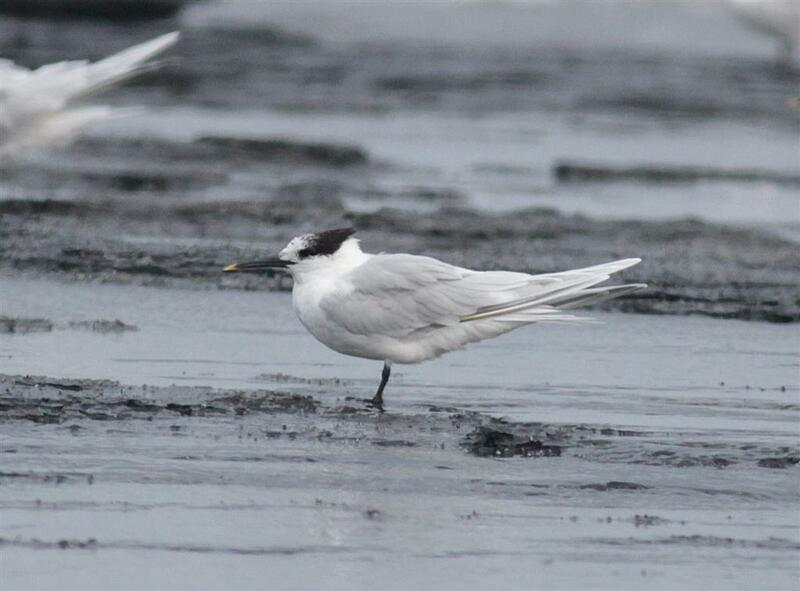 This next tern is a little more familiar to American’s, the Sandwich Tern. This species is almost as common during the summer as the Swift Tern. As you can see in the first photo of this post, the Sandwich Tern is noticeably smaller than the Swift Tern, but still a decent size. In the United States, It’s difficult to see this species outside of Florida, so it was nice to be able to see it here in South Africa and be able to study it much more closely. 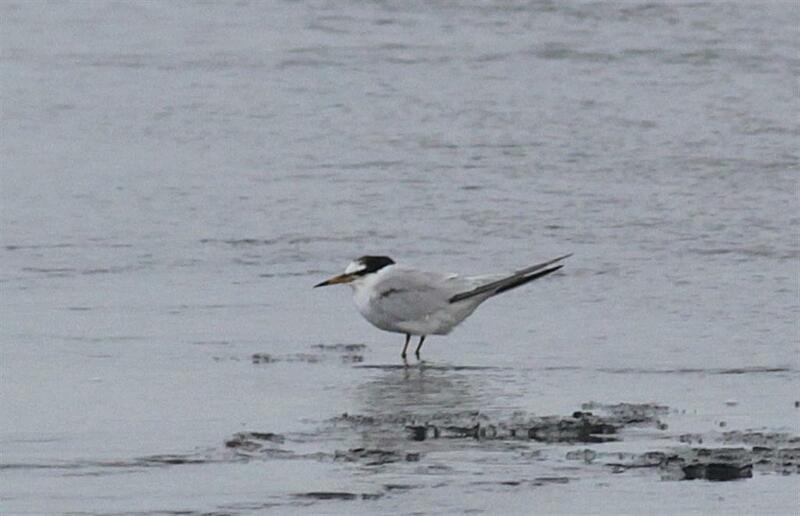 The large black bill with yellow tip really adds of bit of character to this handsome tern. This small-sized tern is appropriately called the Little Tern, and fittingly it is the smallest tern species in southern Africa. 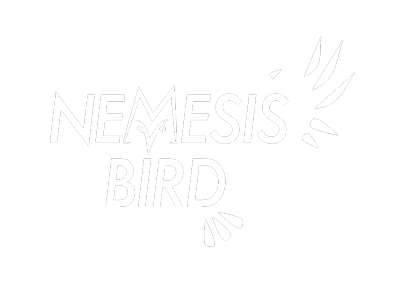 The Little Tern is a common summer visitor to mainly the east coast of southern Africa. Its striking head pattern and yellow bill make it quite unique. I see these terns almost daily working their way up and down the coastline diving for fish. When they are landed they are quite difficult to get close to, so please pardon the poor quality of the photo. While our group was in Cape Town, we took a boat ride out to the famous Robben Island for a tour. On our way out over the open water I noticed a large, dark, tern-like bird harassing the Swift Terns that were catching fish. 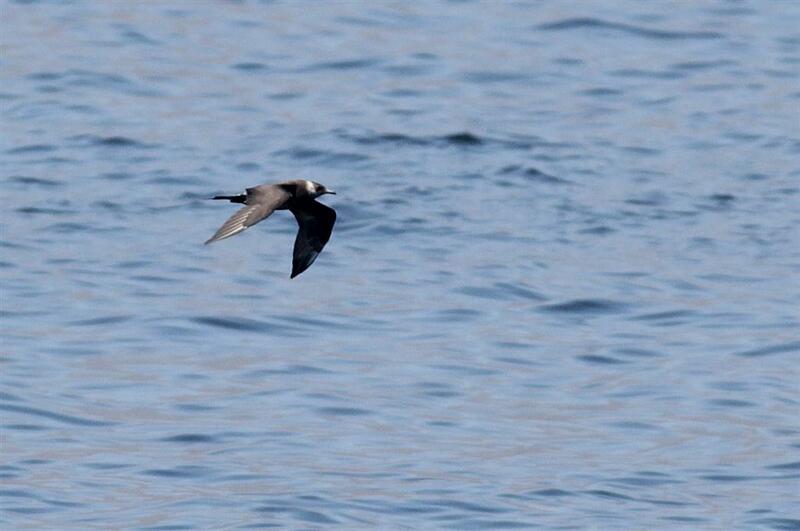 As the groups of terns moved closer to our boat, I realized the dark bird was an adult Parasitic Jaeger! This species is common off the coast of the United States but it was pretty neat to be able to also see it off the southern coast of Africa.